With all of my weaving efforts and energy focused on my new Glimakra 8 shaft countermarche loom, my little Schacht Mighty Wolf 4 shaft loom has stood forgotten and neglected for quite awhile. I had been in the enthusiastic midst of my summer and winter explorations when I found the ad for the Glimakra during the first week of June this year. Every thing else got set aside after that. Eventually I realized that I would have to finish up that project and get it off the loom, so here is what I was working on and what I've done with it since then. .... but I did some samples as mug rugs first. I experimented with different colors for both pattern weft and tabby weft. I was fairly satisfied with these, so I warped the loom for a series of 6 place mats. However, once I started weaving, I really wasn't happy with them. I have long been intrigued by the space dyed look. 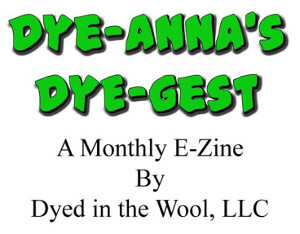 Marie does this quite a bit, but she dyes her own yarns. Since my space is very limited at the moment, I've been looking for ways to fake this technique. Hence the use of these yarns. This experiment involved cutting each length of warp separately and tying it on. I did this in an attempt to tie on each warp end at the same spot in the yarn's color sequence. I wasn't particularly careful about it however, so the effect I like got lost. I did discover that they color sequence on the yarns was a little irregular, so that didn't help either. Oh well. It was an experiment after all. When I gave up on the summer and winter, I also gave up on the place mat idea, as it was weaving up narrower than I'd wanted. However, after staring at the fabric for awhile, I did use some of it to make this diddy bag for my Dad for his birthday. The drawstring is an i-cord knitted from the blue. He was happy with it. I also have an idea to make either a purse or a sock knitting bag for myself as well. Of course, going back to this project gave me with some new ideas regarding using space dyed yarns. Even with the temporary interruption of learning my new loom, I hope to get back to this. Better yet, I hope to someday be able to do my own dying, which I'm sure will yield better results. Happily, I recently found out that Kaz will be doing an ikat workshop next year for the Online Guild. If you are interested in this type of weaving, then I encourage you to join the OLG! For more information, click on the above link, and then on "Subscription Information." I so enjoyed reading this - it'll be a month before I get to weave again. I'll have to weave vicariously through and Marie. We've got a family reunion followed by vacation. I'm already in withdrawal. I'm going to check out the online class - thanks for the information! I can hardly wait to get a "Go Ahead" so I can bend over the beams of my Mighty Wolf (8H). I have so many ideas I can hardly stand it. And you give me even more ideas! Someday, Leigh, I'd love to have a Guided Tour of your studio (aka weaving space). Leigh your space dyed project is great. I think any kind of ikat looking project looks great - just like anything that is purple looks great to me. Wonderful. I like your results using the variegated cotton. I think we, or perhaps I should say "I" become jaded when weaving projects because I have a preconceived idea of how a piece will look, either on or off the loom. I like how both the diddy bag and mug rug look. I bet in a year's time you'll see them in a different light. I'm contemplating the On-line guild but have a 4H loom and not an 8H as the one class calls for. But the ikat class would be worth the tuition. Great reminder, Leigh, of some good end products of weaving. Sometimes I tire of the straight and narrow scarf, table runner, cushion cover object. A cute gift bag is a great alternative. I appreciate your positive reactions!